The war is real, and you are on the front lines! Are you clear on your mission? Are you dressed for battle? Can you recognize your enemy and escape his evil tactics? With Priority studies, you won’t find motivational material lightly sprinkled with Bible verses. 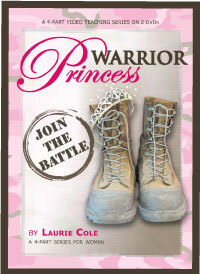 All of our studies are Bible-based and developed by Laurie Cole using in-depth, inductive Bible study methods. As a result, each lesson will enable you to dig into God’s Word and experience the life-changing power of His truth firsthand. Yes, you read that right. Free videos, free Leader Guides, and more are available for all Priority Bible Studies! Whether you’re an individual using one of our studies or you’re participating in a group, you can watch every video lecture by Laurie Cole absolutely free. And if you’re a leader, our free Leader Guides will help you lead your group easily and effectively. We also offer free Week 1 homework (great for last-minute sign-ups), free listening guides, and free promotional materials for all of our studies. All Priority Bible Studies receive a full and complete test drive before they’re finalized and printed. Hundreds of women pilot each study, evaluate every lesson, and provide us with invaluable feedback, information, and constructive criticism. This enables Laurie to prayerfully revise, edit, and improve each study before it ever reaches your hands. Thousands of women have participated in a Priority Bible Study, and many women who participate in one study end up coming back for more. After completing a Priority Bible Study, women feel equipped to embrace God’s best for their lives.